I love Scott Westerfeld's writing. I was introduced to him through a short story and then I went and read the Uglies series, one of the original sparks for the young adult dystopia obsession around today (my favourite in the series being Extras). So when I kept seeing a steampunk novel floating around also by him I was intrigued, I just had to pick it up. My first reaction to the book: Holy moly this font is huge! (I don't know if this was just my copy or not), but my second was being floored by the illustrations. 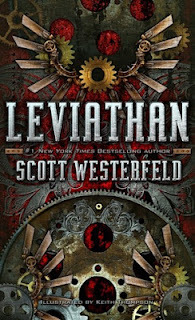 Westerfeld is an excellent world-builder, which is a must when someone tackles steampunk, which has to have a very rich background to it to succeed. Somewhere along the lines of the creation of the book the idea to include illustrations happened, and it really brought the book up several levels. The creations and creatures are amazing to begin with, when described in print, but seeing them actually drawn out brought them to life for me. Every illustration is incredibly detailed and gorgeous. If you don't know what steampunk is, it is the idea of scifi from the time of H.G. Wells (his books are the inspiration for many lovers of the steampunk genre). It's pretty much historical scifi (which sounds a bit like an oxymoron, but I digress). In this case, Westerfeld targets the time of WW1, giving the opposing sides different types of "technology". For Great Britain and their allies, they use the information that Darwin (in this world) had discovered, the ability to unravel DNA, to create great beasts that they use as war weapons. While the other side with Austria uses massive machines and despises the idea of the beasts. What's funny is I actually learned actual facts about WW1 from the book. Now on to the story and characters. I have to admit, I was more drawn to the British pilot character more than the Austrian Non-Prince and that has a lot to do with their personalities and situations and probably the fact that I found the Darwinist Beasts so much cooler and innovative. It does border on more of the MG side, but on an Artemis Fowl level. What's really funny is I forgot Westerfeld was the writer many times throughout the book because the prose and style and story were just so DIFFERENT than any dystopic book written by him. For me this shows how great a writer he is, matching his style to the themes, age-group, and genre. I really enjoyed seeing the two sides interact once the characters meet up near the end. As soon as they met up, I found myself reading so much more. I also adore the fact that no one realizes that Deryn is a girl. Of course she is very, very good at acting like a teenaged boy. I like the way that Aleksander looks up to her in a way right now. The final battle was also quite cool and I'm honestly quite excited to continue reading this series. 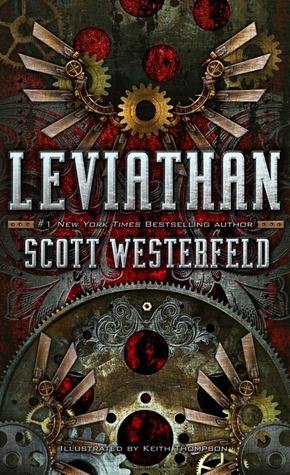 If you like steampunk, read this book. If you like World History, WW1 era, read this book. If you like interesting characters and some of the best world building out there, read this book. The style straddles the line between MG and YA for me, so if you like either of those styles you would probably be fine with this book. Feature & Follow: What made you Start?